Abstract: The purpose of solidarity is to build our movement, and to embody our mutual care and concern for justice. Solidarity works best when we respect each other’s differing needs and life circumstances, understand that there are many ways of being in solidarity, and co-ordinate our responses. It does not work when we attempt to coerce, shame or inflict guilt upon each other, even subtly. The common life initially rests on the constitutive need for the human beings to be combined to form a community of similar which is also a community of destiny, out of which, as Aristotle wrote it, no man could exist humanly, nor simply to survive. When solidarity requires us to follow our group‘s social moral rules, we usually have non-instrumental reasons to do so as ways of standing in solidarity with others, and this is true even when our rules are not as good as they can be. Solidarity often grounds reasons to follow somewhat defective rules, it also grounds reasons to improve our social moral rules as well in order to bring them more in line with our group‘s ideals or make us more effective at promoting our shared ends, which has lots of limitations to refine oneself and grow. It’s each of our basic needs, duty and the purpose for the art of right living by understanding the natural state of each soul, with compassion, liberty and solidarity within to protect the dignity of our divine life and living as a means for keeping us united as oneness in nature to balance natural health. Keywords: Solidarity, Nature, Natural Health, Compassion, Liberty, Dignity, Survival, Existence. Solidarity – you can never be sure. Is it to be polite? Is it to be fair or helpful? We all know, but we are never sure. We all need it from time to time and we all like to offer. We were either raised to be able to share it or we have acquired it by education, environment or personal experience. Solidarity is simply a phenomenon that exists. Solidarity can be simple a way of lifestyle. To support someone and stick by him in good and bad, in his success and failures. It’s nice and correct to help and support each other. In any field of our lives. Today word solidarity is experiencing a crisis. How is this possible? Let’s think about it for a moment. Why do not people hold together anymore? We should still be equal! The reason for this might be our silly prejudices, envy, and our will or determination to change something. How many times would be enough so little. But we all make excuses. Where did the original meaning of the word solidarity disappear? Each one should judge himself first. Let us start to act different. The feeling to help somebody should be mutual and equal, but of course it does not work this way. In our lives there are some who devote and dedicate their lives for others and there are others who mostly just enjoy it. Manipulators, controllers, abusers never question themselves, instead the trust of the innocent is the useful tool for them. As Warren Buffet once stated, honesty is always an expensive gift which we can’t expect it from cheap people. It is too difficult to define the concept of solidarity, because any produced definition would be incomplete, would just expresses one’s point of view. A dictionary defines the word solidarity as supporting each other, reciprocity, fellowship and equality. It’s a simple definition of the word, which of course would mean a lot more than just its literal meaning. People are necessarily dependent of each other in different ways depending on one another. This kind of dependence is a good one, if is chosen with care for sake of both the society and individuals, as well as a whole and take responsibility for others and for the entire community, and vice versa, the community must in turn take care of its individual members. In other words: “One for all and all for one.” This means: one for all also in sharing common ideas, goals, aims and opinions and vice versa all for one for the same correct principles, in means of social conscience and sense of responsibility. There are different ideas about it. It can be understood as a way to tolerance, which means patience, empathy, compassion but also determination. The solidarity is more the idea than the concrete definition. It expresses the respect, acceptance and understanding. It means to be yourself without imposing your opinions to others. The question is what it is all about. One can do something for others without even mentioning he has done it. Just like that. The help for those who need it, who cannot help themselves. Solidarity is an important principle which is supposed to form our social life. It is generally believed that one should prefer the sake of the society to his own. But is it really true today? In order to begin looking at the principle of solidarity and its importance it will be helpful to first look at the meaning of the word itself. Dictionary definitions talk of two aspects of solidarity: the uniting of a group of people with a common purpose, and mutual-dependency (or interdependency) of people. The interdependence we share with our fellow human beings demands that we take responsibility for them in accordance with the measure of what we have been given by God. Personally I trust and believe interdependency. The principle of solidarity has its roots in the scriptures. The book of Deuteronomy tells us: Since there will never cease to be some in need on the earth, I therefore command you, “Open your hand to the poor and needy neighbor in your land.” As has already been stated, solidarity is not just about the duties of the rich for the poor, ‘all are responsible for all‘. Both the Interdependence and the responsibility go both ways. It would be a mistake, of course, to focus solely on rich and poor here. ‘All for all’ means what it says. Here lies one aspect of the importance of the principle of solidarity. Intelligence is one of the most divine gift to all human whether he/she is poor or rich which itself a self-responsibility to protect the same by respecting interdependency.The fragmentation of societies and nations has not brought us isolation from the troubles of others. The rise of individualism has not brought us a better class of person. We have been encouraged to think of being ‘fiercely independent’ as being a virtue, and to feel that relying on other people is a weakness. The reality is that we have never been more dependent on more people than we are now in this age of globalization. The virtue of solidarity is quite demanding. Echoing the Golden Rule of the gospels it ‘translates into the willingness to give oneself for the good of one’s neighbor, beyond any individual or particular interest. Mohandas Gandhi recognized this aspect of Jesus’ teaching and applied it to his own situation. As far as he was concerned, Jesus was the first proponent of non-violent resistance. Its value can’t be seen from the cleverness of a theory though. He said, “It shall be proved by persons living it in their lives with utter disregard of the consequences to themselves”. That is true for the importance of solidarity as well, but we have had our example of how effective it is – like Gandhi – from the beginning, from Jesus himself (1) (2). Once a person or group survived, the need for next step is to exist to maintain and to balance. Solidarity can be extremely effective, but it is always exercised at a cost. Before deciding on a solidarity strategy, we need to know what our intentions and goals are for any given action. So certain questions need to be answered for a proper and genuine implementation of solidarity in its own graceful way. Who are we? Not only your name, but who will be included as members or participants, and why? What are our purposes? Why does your group exist, and what limits or boundaries keep you from overreaching and over extending your time and energy. What are out shared beliefs and values? Focus on values you envision bringing to action. What individual differences do we need to consider? Individual differences represent potential power imbalances between and among group members, such as different economic resources, different education backgrounds, different religious or political views, etc. What do we expect of one another? Consider expectations for time, for being present at meetings, for being prepared, for responsibilities to one another. What message do we want to convey to others? What will your group stand for in the larger community? What responsibilities does your group have in the larger community? How can we protect the integrity of the group? How will you protect your group from burnout, or from being distracted by demands and interests beyond the interests of the group? We are very different groups. We are not necessarily immediate allies nor are we each other’s greatest enemy. We believe we have some things in common. We believe in basic human rights and the need to live with respect and dignity. We believe we must protect this planet, our air, water, earth and food or we will all die. We believe these global corporate and political institutions are serving only the interests of the rich. We all agree it’s time for fundamental and radical change. Solidarity is the way in which our diversity becomes our strength, we build our movements and we protect each other’s lives and rights. Let the give and take be mutual and equal. The global definition of development underlines differences between countries much more than it highlights what those countries share/have in common. Helping without considering people as persons, isn’t solidarity but pity; and projects of “development” will always fail if the culture of the country isn’t taken into account. Cultural differences are seen hampering mutual comprehension, but communication is always possible when people wish to understand the others. We can add that if cultural differences separate countries, they separate people too. Likewise, if international solidarity is impossible, solidarity can’t exist. That’s impossible for anybody to live alone: there is a reciprocal link between meeting of cultures and communication. Language exists to avoid violence, to enable communication between people and life together, beyond every difference. The will to communicate and understand people, in spite of differences between cultures, is a way to implement solidarity: it is a recognition that we belong to the same body, we can’t ignore other people. Solidarity is possible! We just have to look for what gathers us together. And that’s the will to meet other people, this is how we can become wealthy in our minds. We learn to know ourselves through those exchanges: we discover our own culture, our ways of thinking, our own truth we develop. Finally, solidarity is much more agreements on interests or aims between members of a group than helping and development is succeeding in living together: that’s the real process and product of growth (3, 4, 5, 6). As Eric Weil says, “human being is made of worse and best; language and violence: we have to choose in which part we believe” (7). Let interdependency NOT for materialistic benefits and materialistic manipulations! If do, again the same will be under controversy, conflicts and chaos with many perceptions and interpretations that should be avoided at any cost. It’s my kind concern for the practical natural healthy living. Those who fancy that a vegetable diet, or daily prayers, or celibacy, or neglect of family duties, or lip-professions of loyalty to the Masters, are signs of inward holiness and spiritual advancement, ought to read what the Gita, the Dhammapada, the Avesta, the Koran and the Bible say on the subject. One who in spiritual pride reproaches another for doing none of these things, is himself the slave of personal vanity, hence spiritually hemiplegic. Let us keep, cling to, defend, glory in the ideal as such; let nothing tempt us to debase it or belittle it; but let us have the manly honesty to admit that we do not embody it, that we are yet picking the shells on the beach of the unfathomed and uncrossed great ocean of wisdom; and that we, though celibates, vegetarians, “faithists”, psychics, spiritual peacocks, or what not, are not fit to condemn our neighbor for being a husband, an affectionate father, a useful public servant, an honest politician or a meat-eater. Perhaps his Karma has not yet fructified to the stage of spiritual evolution. Or who knows but that he may be a Muni, “even though he leads the domestic life.” We can’t tell. One of the curses of our times is superficial criticism. How true the saying of Ruskin that “any fool can criticize!” (8). Much of humanity has lost connection with our feminine qualities. There is a deep disconnection with the Earth, with our bodies, and with the very essence of life. And as a result, for many people, life has lost its deeper sense of soul purpose or meaning. When we are starved of this connection, we quite literally wither and dry up inside. We can feel isolated and alone. As a result, there is a deep healing needed for our collective planetary soul. And we are called to now offer a place where we can come together in sacred space and undertake a soul retrieval of the feminine, both for ourselves and our larger community. In doing so, we have an opportunity to reconnect with the ancient feminine wisdom that lives both inside our bodies and in the layers of the collective unconscious. In developing increased awareness, you get more in touch with your relationships, your finances, and your creative expression. As you become more aware, more at peace, you develop more confidence, which automatically brings out your skills. The time is changing, not to create a world of inequality, but to express balance, hope, wisdom, and the unique gifts that both men and women share with one another and with the world (9). 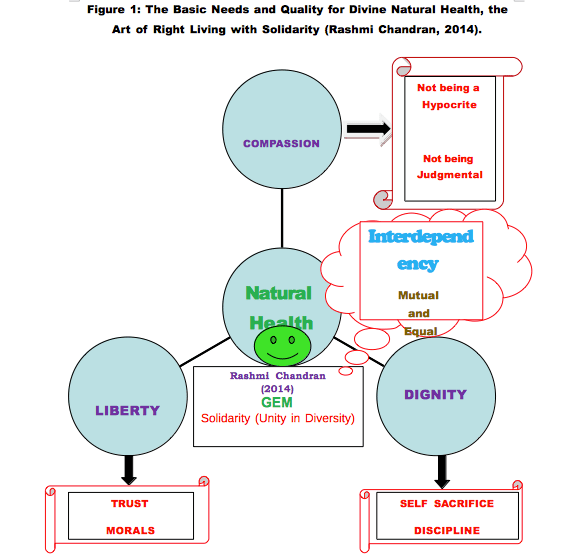 The divinity of each of our life and living depends on the basic needs and quality for a healthier lifestyle, to value and respect mutually and equally accepting the true nature of each individual by themselves to get interconnected with each other’s nature and culture reflects the solidarity in and around (Figure 1). Let each of us try this art of right living with solidarity to strive and thrive balancing the basic needs and quality for divine natural health. Certain thoughts can be implemented in the day today practical life to refine oneself to be better and best. Learn the art of listening without getting defensive. Be open in thinking, not rigid in positions unless you are true to yourself with moral obligations. Challenge and critique other groups and individuals in constructive ways, in a spirit of respect for the morals and culture of each if any. Never make assumptions, predictions, or interpretations no matter what a person looks like or what groups they belong to. Avoid tactics, hypocrisy, judgmental and competition as we all need co-operation and interdependency. Refrain from personal attacks, even with people who strongly disagree. Always focus on how you feel, not what they did. Understand and accept each our priorities, choices and chances through thoughtful and intelligent consideration of issues, circumstances and experiences in a systematic and disciplined way. Never put people at risk or pull them who have not chosen for. Respect and value each other’s personal space and time. Respect the work of all, as all works has its own dignity and morals. Share and care for food, water, medical, other supplies for the needy and deserved in time and support everyone who is hurt, gassed, abused, shot or beaten. Respect the rights to do a certain type of work or job at certain times and places, if you choose to participate, do so within the tone and tactics they set; if you do not agree, do not participate or interfere. Understand that our actions, words, deeds and tactics have repercussions that go beyond ourselves and our immediate groups. Learn the art of silence and the quality to maintain and balance, to cultivate peace within and all around. Always talk about your strategy not others, to value and respect yourself as well as others as oneness in nature. John Paul II – ‘Sollicitudo Rei Socialis (1987): 38. Larousse des noms communs (2008). Collins cobuild english dictionary, Harper collins publishers (1998). Petit Robert, DICOROBERT Inc., (1993). Collins english dictionary, HarperCollins Publisher (2005). Eric WEIL, Logique de la philosophi (1950). H.S. Olcott T.S. Solidarity and Ideals. The Theosophist (1894). Rashmi Chandran The Divine Nature of Women Naturally – A Challenge of 21st Century. GLOBAL EDUCATION MAGAZINE (inscribed in bibliographic database of the Ministry of Culture of Spain with ISSN 2255-033X). Global Education section, Pg. 48 – 52. This article was published on March 8th: International Woman’s Day (issue nº 7). http://www.globaleducationmagazine.com/divine-nature-women-naturally-challenge-21st-century/ (2014). Rashmi Chandran 2014. Mystic Nature – Do Animals Have Souls Like Human Beings? Mystic Nebula (Reviews) ACCEPTED3/14/2014. Dr. Rashmi Chandran 2013. A HAND BOOK ON NATURAL HEALTH IN TODAY’S LIFESTYLE SCENARIO. International E – Publication, International Science Congress Association. (ISBN: 978-93-83520-20-6). Rashmi Chandran 2011. Natural Life – The Path towards Happiness and Prosperity. In: Vakdevatha (A Bilingual magazine publishing from Nigdi, Pune, India). Pp. 69-70.